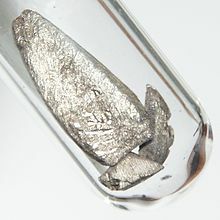 Europium is a chemical element wi the seembol Eu an atomic nummer 63. It is named efter the continent Europe. It is a moderately haird, sillery metal whilk readily oxidizes in air an watter. Bein a teepical member o the lanthanide series, europium uisually assumes the oxidation state +3, but the oxidation state +2 is common an aa: aw europium compoonds wi oxidation state +2 are slichtly reducing. Europium haes na signeeficant biological role an is relatively non-toxic compared tae ither hivy metals. Maist applications o europium exploit the phosphorescence o europium compoonds. This page wis last eeditit on 16 Januar 2016, at 08:49.